Are you a risk taker who’s looking for an opportunity to “raise the stakes”? 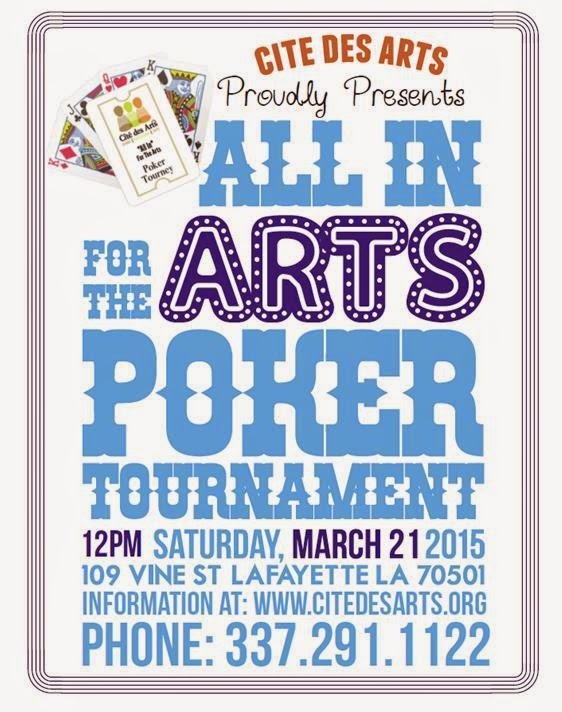 On Saturday March 21, 2015, from noon ‘til 6pm, you can be “All In For The Arts” when you join Cité Des Arts for a charitable poker tournament where 10% of the players will WIN and money helps benefit the arts and programming at Cité Des Arts. Be “ALL IN” when you purchase pre buy-in tickets for $60 at citedesarts.org, or buy-in the day of the tournament for $80. Because it is a charitable contribution, money spent on buy-ins is considered tax deductible. Food and drinks will be available for purchase. Buy tickets online at citedesarts.org or call for more information at 337-291-1122.